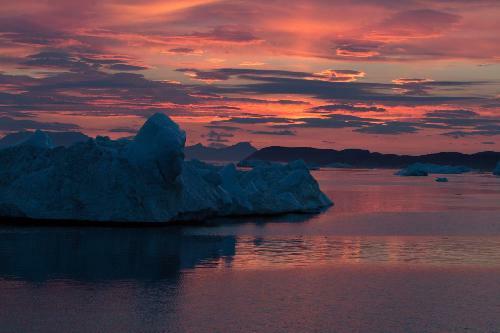 Zachariæ Isstrøm, a glacier in northeast Greenland, began a rapid retreat in recent years, a new study reports. The glacier helps to drain 12 percent of the Greenland Ice Sheet and has the potential to raise sea level significantly if it were to melt, according to a study based on 40 years of glacier data including satellite observations. Jeremie Mouginot and colleagues studied the evolution of Zachariæ Isstrøm and its northerly neighbor, the Nioghalvfjerdsfjorden glacier. Zachariæ Isstrøm's acceleration increased by a factor of three in 2012, they report, and between 2002 and 2014, the area of the glacier's floating shelf shrank by 95%. Meanwhile, to the north, the Nioghalvfjerdsfjorden glacier did not experience such dramatic retreat or thinning. Mouginot and colleagues suggest increases in air and ocean temperatures may have played a role in Zachariæ Isstrøm's dramatic retreat. They believe that Zachariæ Isstrøm may continue retreating rapidly, and that the Nioghalvfjerdsfjorden ice shelf will become vulnerable to break up in the near future if the thinning it is experiencing continues. Their study provides an improvement in scientists' understanding of ice sheet dynamics in northeast Greenland.This research appears in the 13 November 2015 issue of Science.